Samples can be submitted in three formats: raw materials (tissue, cells, soil, etc. ), purified nucleic acids (DNA or RNA), or prepared libraries¹. Please read carefully the quantity and quality requirements for each type of sample. Failure to deliver required amounts and quality of sample material may invalidate all ACGT, Inc.’s obligations for that particular order. All extracted DNA samples will be evaluated for quantity and quality with NanoDrop spectroscopy, Qubit fluorometry, and/or agarose gel electrophoresis. All extracted RNA samples will be evaluated for quantity and quality (RIN values) with NanoDrop spectroscopy, as well as 2100 Bioanalzyer with RNA 6000 chip. Any significant issues with sample quantity or quality will be reported to the individual requesting the service. *These are minimum requirements. ACGT, Inc. strongly recommends that they be EXCEEDED if possible. ACGT, Inc. provides NGS library preparation services for Illumina NGS platforms ONLY. All DNA samples received for NGS library construction will be evaluated for quantity and quality with NanoDrop spectroscopy, Qubit fluorometry and/or agarose gel electrophoresis. All RNA samples received for NGS library construction will be evaluated for quantity and quality (RIN values) with NanoDrop spectroscopy, as well as 2100 Bioanalzyer with RNA 6000 chip. At the request of the customer, rRNA or globin RNA can be depleted from the samples. DNA or RNA will be used to prepare single or dual-indexed libraries using kits and/or methodologies appropriate for the specific service requested. 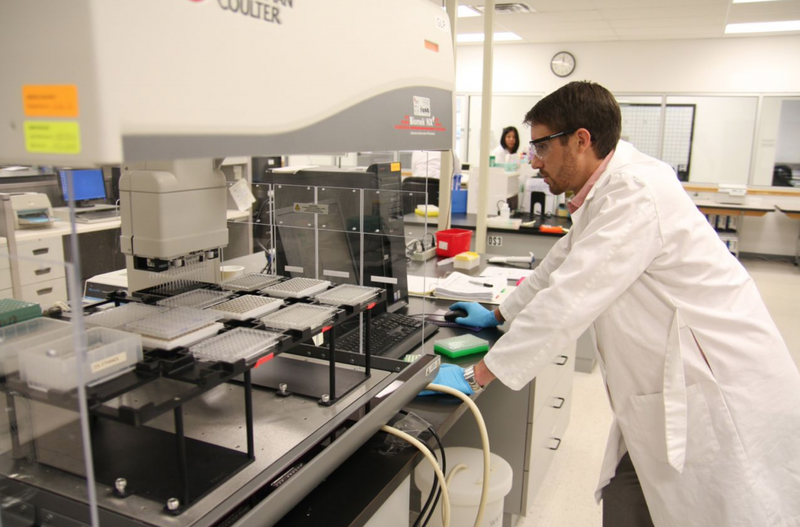 Appropriate quality control analysis will be performed at every step, and the libraries will be quantified with Qubit fluorometer, and/or the Agilent 2100 Bioanalyzer. If multiplexed libraries are requested for a pooled MiSeq or NextSeq500 run, individual indexed libraries will be prepared as appropriately molar ratios. The resulting information will be used to perform library evaluation and pooling adjustments. This step will be performed at ACGT, Inc.’s discretion. The requesting investigator will be provided with all results of library QC. ACGT, Inc. provides NGS services using Illumina platforms ONLY. Please submit an aliquot of your stock library; we will evaluate it and dilute it to an appropriate concentration. All NGS libraries received for analysis on MiSeq or NextSeq500 platforms will be quantified via Agilent 2100 Bioanalyzer and/or Qubit fluorometer. Analysis using qPCR with the Kapa kit is available upon request. Depending on results of the library QC, size-selection on BluePippin platform may be performed. Pooled multiplexed libraries will be loaded onto MiSeq or NextSeq500 flow cells to generate single or paired-end reads, and levels of coverage required for requested services. At least 30 µL per library is required, with concentration between 10 and 20 nM. Information regarding kits or methods used to prepare the libraries (including adapter and index sequences) must be provided. Any custom sequencing primers required for sequencing analysis on Illumina platforms must be provided in the amount specified by the library kit provider. Submission of incorrect information regarding the library adapter and index sequences may invalidate all ACGT, Inc.’s obligations for that particular order.